The Strapack RQ-8A is considered the "Gold Standard" of the strapping industry. 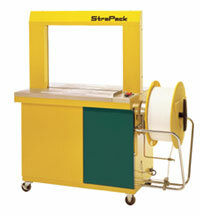 This strapping machine is designed with two belts to match various package sizes. The machine is automated which allows it to be used for in production line for high output operations. 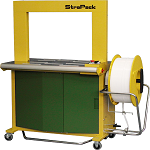 This Strapack machine carries a standard power supply of 220V Three Phase with an optional 440/480V Three Phase or 110V Single Phase. A conveyor top can transport products through the machine, and with a conveyor speed up to 30m/min with the inverter system, this strapping machine produces rapid results. 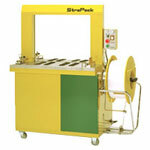 This Strapack machine carries a standard power supply of 220V Three Phase with an optional 110V Single Phase. The Strapack RQ-8A is innovatively designed for easy operator use and easy strap loading. 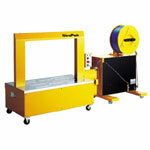 The RQ-8A strapping machine allows for the use of 1/4, 3/8, 1/2, and 5/8 inch strapping. The operator is easily able to adjust strap tension to accommodate many different products. The design of this strapping machine makes it so there is no need for lubrication which makes the maintenance cost of the RQ-8A very minimal. Strapack is renowned for their commitment to excellence and high quality products. The high quality Strapack RQ-8A comes with a 6 month warranty and guarantees great results. Boatman Marking has a full line of Strapack strapping machines and strapping equipment to fit your individual packaging needs.